♥Sunglasses: Aldo Nail Polish "ice cream cupcake" By Mac What do you think of this look? i love the look really pretty do a close up of the polish!! CUTE! love the color of the blazer!! I like the jacket.I don't think I can wear jumpsuits tho. It is not my style. Hihi. So chic! Love the monochromatic with the pop of color! The blazer is so HOT! Orange is probably my favorite summer color. 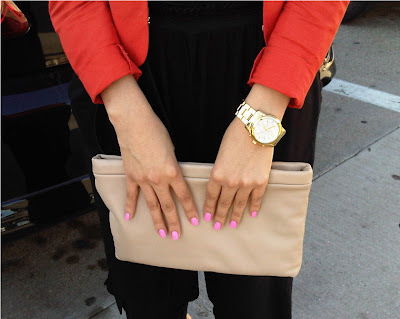 great way to add pops of color to any outfit! SUPER CUTE. Does the blazer run bigger than the usual F21 clothes? It says that on the website and since I live here in Hawaii they have NO blazers in the store. @Dani what can i say i love blazers winter and summer LOl. @Blanca1018♥ thank you blanca :-) im glad you loved the outfit. @Kimmiepooh omg i think the same!! love orange, blue and hot pink for summer great colors. @Fashion, Music, Life: i got mine in small because the XS it was super small on me ! !